The XIRR function is one of the financial functions. It is used to calculate the internal rate of return for a series of irregular cash flows. values is an array that contains the series of payments occuring irregularly. At least one of the values must be negative and at least one positive. dates is an array that contains the payment dates when the payments are made or received. 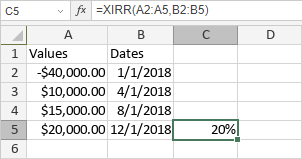 Dates must be entered by using the DATE function. guess is an estimate at what the internal rate of return will be. It is an optional argument. If it is omitted, the function will assume guess to be 10%.